Life with Lesley: BFS Back to School Giveaway! 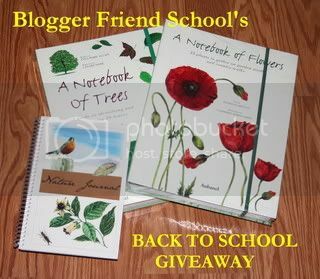 BFS Back to School Giveaway! I just enrolled in Blogger Friend School 2008-2009. And they are having an amazing giveaway! Ends October 6th. This package consists of two beautiful hardbound Nature books and a Nature Journal! We hope that this will give a homeschooling family a special opportunity to enjoy their family learning with implementing nature walks into your yearly homeschooling schedule. Hi Lesley, Thanks for signing up for the BFS giveaway! We think everyone will enjoy the assignments and meeting new classmates. Have a great day!